The ancient Acupressure Therapy discovered by the knowledgeable Sages and Ascetics is of great importance because it is based on the science of Spirituality. By applying pressure on specific body points that control the flow of chetana-shakti (Sentient energy), obstacles in its flow are eliminated and ailments overcome. This is the principle on which Acupressure Therapy functions. There are three acupressure techniques of applying pressure. Generally, pressure is applied vertically on the point, thereby exerting pressure on the inner layers of the body. In certain diseases, however, the pressure is applied at an angle. When using this acupressure technique, start applying pressure right on the center of the point, deeply or forcefully. Continue applying this pressure without lifting the finger, and move the finger in a circular manner so as to create a spiral as shown here. The movement should be so slow that in one second one to one and half circles are completed. A. When should centrifugal acupressure technique be used ? With application of pressure on the point through the centripetal technique, circles of distressing energy around the point are created, giving rise to a blackish whirlpool. It unites the distressing energy created by the mantriks in Patal at that centre. (This sensation is perceived by the brain.) Pressure on the point destroys the distressing energy center. 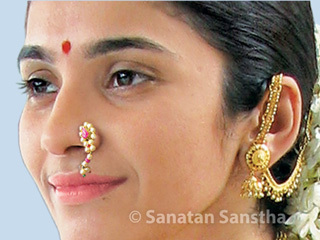 Consequently, particles of energy and waves of sattvik energy spread all over the body. When using this acupressure technique, apply light pressure. Start by applying pressure over the area adjoining the pressure point and move inwards in a spiral manner. Then, move fast towards the main point making two to three circles in a second. This rotation should be opposite to the technique described in the centrifugal method. A. When should centripetal acupressure technique be used? With application of pressure on the point through the centripetal technique, circles of distressing energy around the point are created, giving rise to a blackish whirlpool. It unites the distressing energy created by the mantriks in Patal at that centre. (This sensation is perceived by the brain.) Pressure on the point destroys the distressing energy centre. Consequently, particles of energy and waves of sattvik energy spread all over the body. A. Often, a disease is not diagnosed; then, it becomes difficult to decide between the centripetal and centrifugal acupressure technique. At such times, applying steady pressure vertically on the inner layer of the body gives expected results. C. If pressure is applied appropriately over the painful point, the disease is alleviated. D. No sooner is the disease cured, pain in the point vanishes. E. If the patient receiving the treatment has a very delicate, sensitive skin, then before applying pressure, it should be dusted with powder or smeared with oil. Progress in science has not just taken man away from nature, but the friendly relationship with each other and loving touch is also becoming rare. At such times, the expert who is giving the therapy can, with his touch, perceive much more about the individual than the state of the disease in him, and the process of curing the disease can be faster. Thus, it is possible to revive our ancient tradition of touch communication or touch healing to cure a disease. Why special importance is given to Acupressure points on the soles, palms, back of the hand and ears ?